The increasing frequency, severity and consequences in Europe of floods, storms, forest fires and other natural hazards sensitive to climate change has clearly shown the shortcomings of existing environmental monitoring and information systems. The observed inefficiency is primarily a consequence of historical and organizational factors. An exorbitant amount of work on data and service standardization would be required to build more efficient information systems using state-of-the-art technology. Emerging technology in risk monitoring and management has the potential to speed up the necessary organizational and structural changes. Ad hoc wireless sensor networks and the collective intelligence of the Sensor Web; the plug-and-measure paradigm of IEEE 1451 smart sensors; the Semantic Web; and the OGC Sensor Web Enablement architecture: all these address critical factors of the state-of-the-art technology. However, none of the currently available and emerging technologies offers rapid deployment, easy maintenance, quality assurance and automated data processing along the whole information processing chain from smart sensors and wireless ad hoc sensor networks, over automated data loggers and value-added middleware services, to user applications capable of dynamically integrating all available data sources at run time. 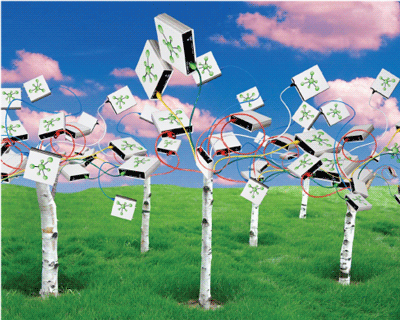 Figure 1: 'SANY'-trees - sensors anywhere in our environment. Sensors Anywhere (SANY) is an ambitious FP6 IST Integrated Project dealing with sensor networks for environmental and risk management applications (Figure 1). SANY aims to contribute to joint efforts of the European Commission (EC) and the European Space Agency (ESA) on 'Global Monitoring for Environment and Security' (GMES) by improving the interoperability of in situ sensors and sensor networks and taking up the challenges mentioned above. This means specifically that the Sensor Service Architecture (SensorSA) developed in SANY shall allow quick and cost-efficient reuse of data and services from currently incompatible sources in future environmental risk management applications across organizational, administrative or regional borders. In order to assure the sustainability of the project results, SANY reuses the open standards from W3C, OASIS, ISO and Open Geospatial consortium (OGC). One of the most promising standardization efforts is currently happening within the Open Geospatial Consortium Sensor Web Enablement initiative (OGC-SWE). The goal of OGC-SWE is to enable all types of Web and/or Internet-compatible sensors, instruments, and imaging devices to be accessible and, where applicable, controllable via the Web. The OGC-SWE vision is to define and approve the standards foundation for interoperable Web-based sensor networks. For this purpose, OGC-SWE specifications include a standardized model for representing and exchanging observation results as well as an information model and encodings that enable the discovery and tasking of Web-resident sensors. Of special interest for SANY are the following: a service for retrieving sensor 'observation' data and meta-information, the so-called 'Sensor Observation Service' (SOS); a service for sensor planning and executing tasks, called the 'Sensor Planning Service' (SPS); a service that allows users to subscribe to specific alert types, known as the 'Sensor Alert Service' (SAS); and a service that facilitates asynchronous message interchange between users and services, and between two OGC-SWE services, called the 'Web Notification Service' (WNS). Three validation subprojects of SANY demonstrate the feasibility of building risk management applications with SensorSA. The first validation subproject (Figure 2) illustrates the use of SensorSA services at data acquisition level, as well as vendor independence and the feasibility of building virtual networks across administrative and technical borders. Furthermore, it is concentrating on assessing air pollution episodes, tracking pollution back to its source and predicting the air pollution in urban areas or around industrial zones. 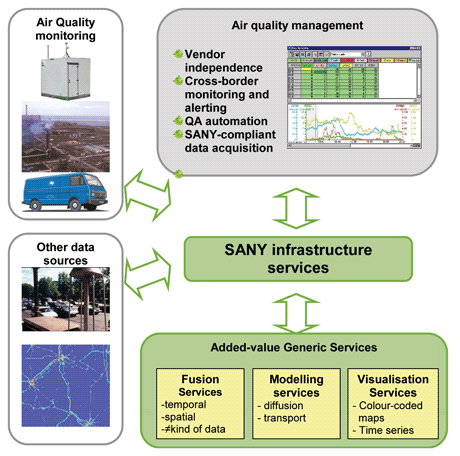 Figure 2: SANY air quality management subproject. The second validation subproject concentrates on coastal water management issues, such as assessing, modelling and predicting bathing water quality with user-determined 'what-if' scenarios. It uses advanced data fusion services to demonstrate the feasibility of run-time binding of heterogeneous data sources and the run-time choice of data fusion service, and to predict microbiological contamination through data fusion using all available real-time measurements and the results of microbiological water sample analyses. The real-time data sources used by this subproject include meteorological data, sea temperature, turbidity, salinity, chlorophyll and dissolved oxygen levels. Finally, the third validation subproject concentrates on geohazard monitoring in a complex urban environment, which means assessing the structural instability of architectural objects caused by human activities (eg tunnel excavation). It demonstrates the integration of wireless ad hoc sensors into SensorSA networks; rapid deployment, auto-configuration and self-management; and data fusion of in situ and Earth Observation data sources. The authors wish to thank the Information Society and Media Directorate General of the European Commission (DG-INFSO) for co-funding the integrated project SANY within the area of ICT for Environmental Risk Management.